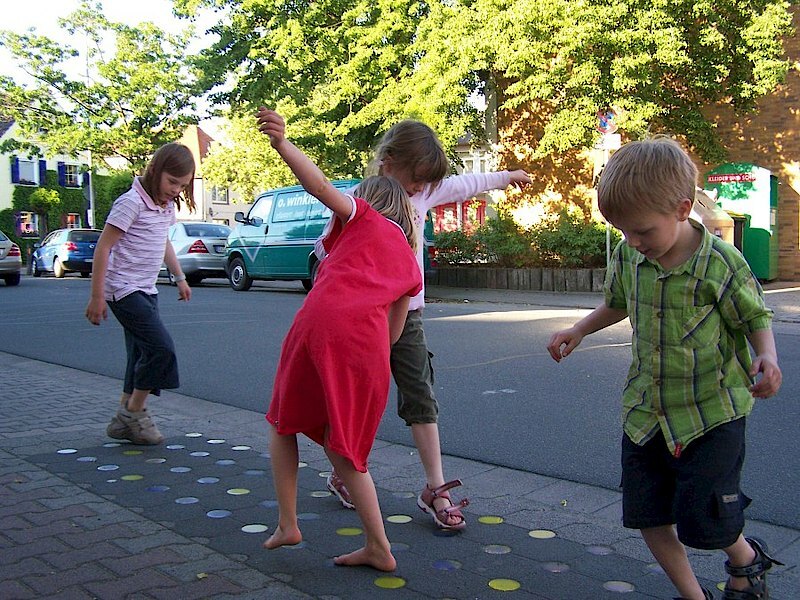 The city of Griesheim has already done a project to redesign areas for children in 2008, afterwards they started to focus on pedestrians who have problems to master long distances due to illness, disabilities or their age. During the project to redesign ways for children the city installed about 100 objects on school routes to give children the opportunity to experience and explore their way to school differently. Those objects were designed to relax, play, jump, and climb or to make the way easier to remember. Aim of the project was to give back people who were usually mostly ignored with regard to city design – like the elderly, disabled and ill people – the urban space. The city of Griesheim wanted to be more attractive for people with special needs. They intended to change and redesign the city to give people with needs the opportunity to meet and be part of public life, as well as places to rest and relax for a brief time. First, it was important to find the places most frequented by seniors and where more places to stay were needed. Results of the Identification Phase were compared with the actual situation. Furthermore, the city was examined for more options to transform streets and places. The city was furnished differently for people with needs. Afterwards the citizens made an evaluation of the redesigned spaces.